Home » If You Don’t Wear It, Sell It! Does it make sense to keep the piece of jewelry simply because you inherited it? What benefit can you gain from keeping the unworn jewelry? Could selling the jewelry be the next step to something better? 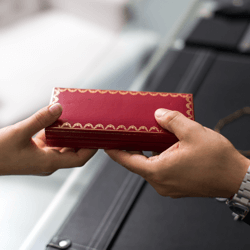 When you inherit a piece of jewelry through an estate sale, as a personal inheritance, or as a family heirloom or gift, you are also inheriting an emotional weight you may not be prepared for. The jewelry reminds you of your relative and, in the spirit of keeping their memory alive, you could feel an obligation to keep the piece of jewelry in the family. The truth is, many times, inherited pieces sit unworn and unused for decades, waiting to be passed down to the next generation. But what if you changed the perspective? There is another way to keep the loved one’s memory alive. Selling that jewelry could allow you to take the gift of the inheritance and do something with it NOW to help you and your family. In this way, your loved one could continue to take care of you now, with the inherited piece of jewelry. Reality Check: That jewelry is out of date and out of fashion, but you are planning on saving it for your kids. If you don’t wear it because it’s out of date and out of fashion, chances that your kids will wear it are slim to none. Your loved one left the jewelry to prolong their legacy, to take care of you and your family, and you have the chance to make that happen. The truth is, your loved one left you the jewelry to take care of you. The truth is, your loved one left you the jewelry to take care of you. The love and memories associated with that piece of jewelry will far outlive your loved one. The jewelry doesn’t have to sit unworn in your jewelry box, waiting for the day to come when it will miraculously be in style again. Take the step and let it take care of you by selling it and using the proceeds to help your life now. Contact us at M.I. Trading today for your free consult. If you don’t wear it, it just makes better sense to sell it!